To guide the discussion, this paper presents seven key performance indicators that Metrolinx will apply to measure progress toward the goals of the Regional Transportation Plan (see Figure 26). These performance indicators are useful for providing a closer look at existing and future conditions. The ability to measure the performance of transportation network is improving, but remains a work in progress. What modes do we use? Different markets use different modes. Several distinct travel markets exist within the GTHA, and different strategies will be needed to address the unique transportation challenges that each presents. Travel markets represent, very broadly, the types of trips that people make throughout the region, and are defined by geography (trip origins and destinations), trip length, and the mode(s) of travel that are predominantly available or used (automobiles, transit and active) for trips within the market. As shown in Figure 28, the single largest travel market identified represents trips made within any single- or upper-tier municipality in the GTHA outside of Toronto. In 2031, this market will represent 47% of all trips in the GTHA, 82% of which are forecasted to be made by car. The markets for travel between single- and upper-tier municipalities (including Toronto, other than downtown) represent an additional 19% of trips, most of which (87%) are also forecasted to be by auto. Together, these markets represent a challenge, and an opportunity, to increase transit use throughout the GTHA. A majority of trips from all parts of the region that are destined to downtown Toronto are made by transit, and a significant number (23% in 2011, rising to 25% in 2031) of trips made within Toronto use transit. Otherwise, the transit mode share is much lower for trips to, from and within municipalities outside of Toronto, increasing only slightly by 2031. Auto trips can be expected to represent 94% of all trips between single and upper-tier municipalities outside Toronto in 2031, down only slightly from 97% in 2011. Overall, cars can be expected to continue to carry a majority of trips in the GTHA (from 73% in 2011 to 71% in 2031, see Figure 23). Considering all trips that cross upper- or single-tier municipal boundaries, including those trips destined for Toronto, the transit share is substantial for all trips across the entire day (16%). This relatively high percentage of cross-border trips is marginally higher for work trips (18%) than for non-work trips (13%). Nonetheless, 13% transit share for non-work trips is an encouraging number, especially given that GO RER improvements to off-peak service has not been introduced to the region. In addition, the all-day percentage is only slightly below the a.m. peak share (20% for work and non-work purposes), presenting an opportunity to highlight the potential value of fare and service integration among transit agencies. 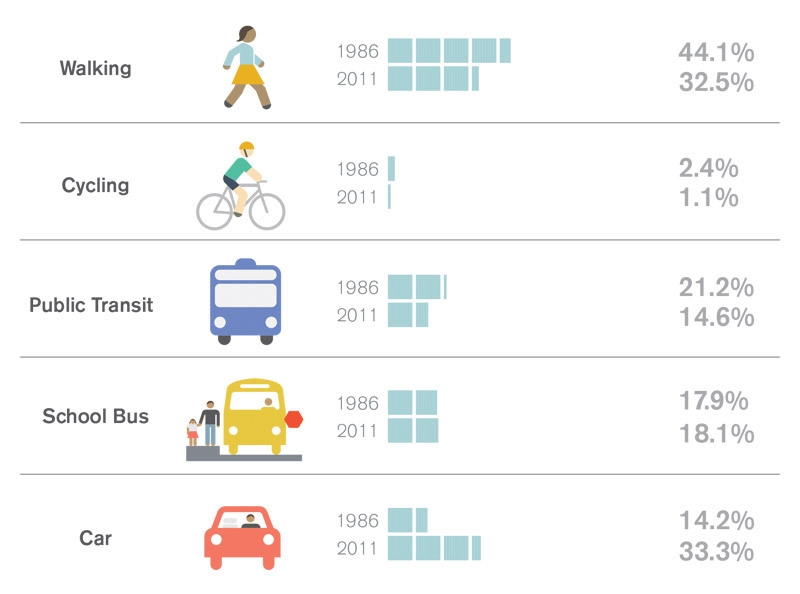 Trends in transit ridership. Transit ridership across the GTHA has outpaced population growth over the last decade, particularly for GO Transit and the other transit systems outside the City of Toronto (see Figure 29). At the same time, per-capita transit ridership levels (see Figure 30) still vary considerably among municipalities, with Toronto residents taking transit about four times more often on average than residents of Mississauga or Hamilton, and still eight to ten times more often than residents of Brampton, which has experienced a 70% growth in total transit ridership since 2008. Areas of the GTHA that have the lowest transit ridership today are those that will also experience the greatest rates of future population and employment growth: a challenge to the goal of increasing transit Mode share. Cycling is growing as a mode of choice. Walking and cycling carry a substantial share of trips within downtown Toronto, and to a lesser degree within the rest of Toronto and other GTHA municipalities. Active modes are negligible for longer trips to downtown Toronto, and between single and upper-tier municipalities. By 2031, walking and cycling mode shares are expected to grow within Toronto (even representing a majority of trips within downtown Toronto), but not elsewhere. Cycling and walking trips all day for different travel markets are shown for 2006 and 2011 in Figure 31. The number of cycling trips increased tremendously from 2006-2011, more than doubling within downtown, and increasing by 50% - almost 100% for most other travel markets. Taxi mode share. Taxi is another mode that demonstrates clear geographical patterns. Taxi trips within downtown Toronto were 2.8% of all trips made all day in 2011. The taxi mode share for trips between downtown and the former pre-amalgamated City of Toronto is 1.7% all day, and drops to about 1% for trips within the former City of Toronto. 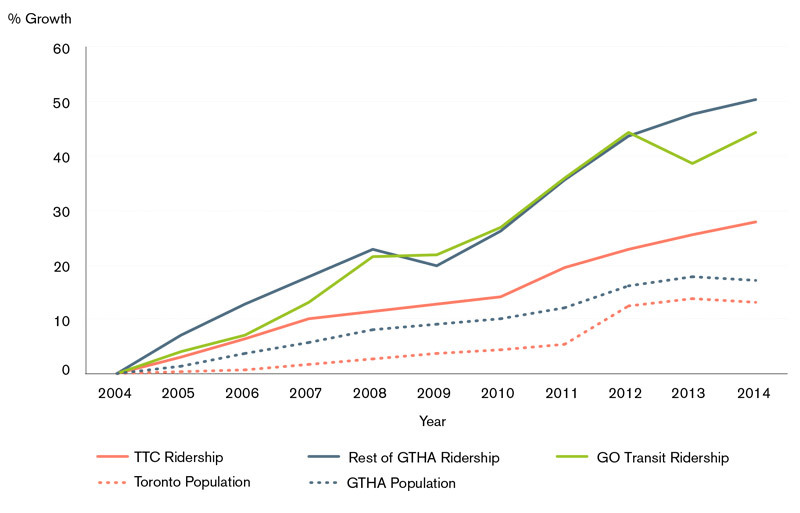 On average throughout the GTHA, the taxi mode share is low at about 0.4% of all trips. Figures for emerging, private, on demand services such as Uber are not known. How much do we drive? Given the growth expected in the region, the total vkt in the GTHA is forecasted to increase from 17.6 million km in 2006 to 24.0 million km in 2031 in the morning peak period alone, with the committed rapid transit network in place. This increase is primarily due to the increase in total population, as the total vkt per person will remain about the same, decreasing only slightly from 2006 to 2031 (3%). Despite this 3% decrease in per capita vkt, the region is expected to increase in population by 40%, leading to an increase in overall emissions of approximately 36%. However, due largely to improvements in automobile fuel efficiency, GHG emissions due to (morning peak) vkt will actually decrease by 25% over this period, assuming 5% of vehicles will be electric by 2031. What is the impact on the climate? Transportation emissions are rising. Since 1990, Ontario’s GHG emissions from transportation have risen more than those from any other sector, and now represent the largest source of emissions, at 34% of all emissions in the province. Over three-quarters of transportation emissions come from cars, trucks, buses and other on-road motor vehicles. The Province of Ontario has succeeded in meeting its 2014 target of reducing total GHG emissions to 6% below 1990 levels, largely through shutting down coal-fired electricity generating plants and the slowdown in the manufacturing sector. The province has further adopted the ambitious goals of a 15% reduction in total GHG emissions from 1990 levels by 2020, a 37% reduction by 2030, and an 80% reduction by 2050. Reductions from the transportation sector are expected to play a significant role in meeting these targets. Today, driving is the dominant option in many of the GTHA’s fastest-growing suburban areas, and is likely to remain the dominant option into the future (see Figure 28). Overall vehicle kilometres travelled in the GTHA are forecasted to continue to increase with population growth. Even though vehicles are becoming more fuel efficient and electric vehicles are likely to make up an increasing share of the vehicle fleet, total vkt is still increasing, potentially offsetting individual vehicle direct emissions efficiency gains. Further, overall GHG emissions could continue to rise due to the lifecycle emissions impacts of personal vehicle use. Levers to slow growing emissions. Ways in which the Regional Transportation Plan can contribute to Ontario’s goal of reducing overall GHG emissions include promoting a shift in individual travel choices from driving to more energy-efficient options like public transit, active transportation, carpooling or teleworking, and enabling shorter, fewer and more efficient car trips by building denser, mixed-use communities. Providing people with an attractive and flexible suite of transportation alternatives that allow them to reach work, education, shopping, health care and social opportunities will be essential to reducing reliance on single-occupant vehicles. Links to energy and emissions. In addition to promoting a shift in individual travel choices, Metrolinx will release an Energy and Emissions Management Plan in 2016, which includes actions for minimizing energy and emissions from its fleet and facilities. The Plan includes initiatives to promote a culture of continuous improvement in energy conservation, as well as investing in capital projects and technology solutions that incorporate best practices in energy management and conservation. Electrification of transit will help reduce emissions. In addition to encouraging mode shift from single occupant vehicles to more sustainable modes, the transit system itself is a source of GHGs. Electrification of transit is another way to reduce the GHG impacts of the transportation system. The GO RER program is part of the committed suite of transit projects. Most of the electrified portion of the network is planned to operate with 15-minute headways, all day (see Section 2.2). The production of electricity in Ontario is relatively clean, relying primarily on nuclear and hydroelectric sources for generation, and as a result, in 2031, a diesel locomotive on average will produce about 20 times more GHG emissions per km than an electric locomotive or Electric Multiple Unit (EMU) train. The current GO RER service concept is expected to provide approximately triple the total number of train service km in 2031, compared to just increasing current service levels to match population growth, while emitting only half the total greenhouse gases (see Figure 32). Links to air quality. In addition to GHGs, motor vehicles emit air pollutants such as sulphur oxides, nitrogen oxides, volatile organic compounds and particulate matter. Measures such as Ontario’s Drive Clean program have led to significant reductions in these smog-forming air pollutants and fewer smog days. The electrification of both personal vehicles and public transit, including the GO Rail fleet, will further contribute to reductions in air pollutants and have a positive impact on air quality and health, particularly for people living in close proximity to major transportation corridors. Climate adaptation and resilience are essential. Transportation authorities throughout the GTHA need to prepare for the extreme weather that climate change will bring, such as more frequent and intense rainstorms and more extreme temperature fluctuations, which can lead to flooding and other impacts on transportation infrastructure. Metrolinx and municipalities across the region are working to identify climate-related vulnerabilities of their transportation infrastructure and other interdependent systems, including electricity and stormwater. Further, beyond enhancing the resiliency of infrastructure itself, Metrolinx is helping to improve the overall resiliency of the region and the communities it serves by providing integrated, multimodal transportation options to build more redundancy in to the transportation system. Ontario’s new Climate Change Action Plan was released in June 2016, the Province’s five year plan to fight climate change, reduce greenhouse gas pollution and transition to a low-carbon economy. The Infrastructure for Jobs and Prosperity Act, 2015 establishes planning principles for future infrastructure projects that minimize environmental impacts and are resilient to climate change. The Metrolinx Sustainability Strategy (2015-2020) promotes the construction and operation of transportation infrastructure that is more resilient in the face of extreme weather events. Metrolinx will establish a Corporate Climate Adaptation Plan in 2018 for facilities, practices and protocols. Metrolinx will release an Energy and Emissions Management Plan in 2016 for the fleet and facilities. How long does it take to get to work? New investments in public transit infrastructure will have an impact. Currently funded transit projects from The Big Move will have on impact on the time spent on transit across the GTHA in 2031 (see Figure 33). For example, in Toronto these projects will reduce the average transit travel time from 46 minutes to 44 minutes. 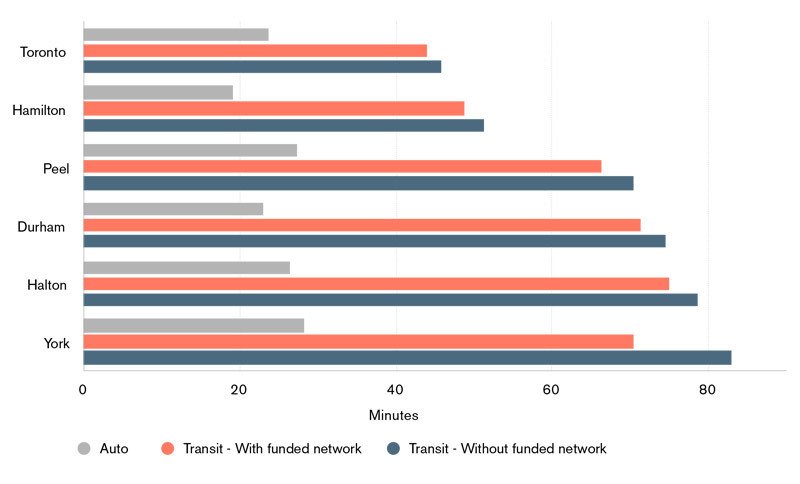 The greatest impact would be in York Region, where transit trips would be reduced from 83 to 70 minutes. The average transit travel time is expected to improve with the committed investments, but different types of complementary strategies will be needed to have a significant impact on overall commute times. See Sections 4.2 to 4.4 for a full discussion of these strategies. Is transit available and does it provide access? In particular, how well the transit system connects where people live to jobs is a key indicator of the health of the transit system. To be effective and induce high transit mode splits, transit must not only be fast and reliable, but it also must be convenient, frequent, and take people where they need to go. Network coverage. As shown in Figure 34, the GTHA is currently well-served by transit, with 90% of people and 92% jobs within walking distance of some form of transit (400 m for local services and 800 m for rapid transit). However, in 2011 only 10% of residents and 20% of jobs were within walking distance (800 m) of rapid transit. With the committed transit network in place, this is expected to increase to 21% and 29%, respectively, in 2031 (see Figure 35). The presence of a frequent transit network (transit service operating every 10 minutes or less) can greatly enhance overall access to the transit system and connectivity to destinations because the time penalties associated with long transfers can impose significant barriers on overall mobility. While most of Toronto is well served by a frequent transit network, other than in some parts of Brampton and Mississauga, the frequent transit services are sparse. About 87% of Toronto residents are within walking distance of frequent transit, whereas only about 25% of residents in the rest of the GTHA are within walking distance of frequent transit (See Figure 34). Access to employment. Although the vast majority of people in the GTHA have access to some kind of transit service, the connectivity to employment opportunities that the transit system provides varies considerably throughout the region. Figure 36 shows the number of jobs that are accessible from each part of the GTHA within 45 minutes by transit (including walk access time, wait time, transfer time(s) and in-vehicle time). The map highlights many areas that have high population but relatively poor access to employment opportunities by transit. There are also many areas that have good access to employment but few residents, such as the airport corporate centre or the large employment centres near near Highway 400 at Highway 407 in Vaughan, and around Highway 404 at Highway 7 in Markham. Figure 37 shows the number of jobs in the GTHA that are accessible to the average resident of downtown Toronto, Toronto, and the entire GTHA, within 45 minutes and 90 minutes by transit. A person living in downtown Toronto has access to almost 600,000 jobs (about 19% of all jobs in the GTHA) on average, whereas a person living elsewhere in the GTHA has access to only 110,000 jobs on average (about 4% of all jobs in the region), within 45 minutes by transit. Within 90 minutes by transit, the average resident of downtown has access to 43% of all jobs in the region, and the average resident of the GTHA has access to 23% of all jobs within the region. A study conducted by the Brookings Institute looked at accessibility to transit and employment in 100 metropolitan areas in the US, including the number of jobs accessible within 90 minutes by transit to the average resident of each area. Results for similar-sized cities were similar to results presented in Figure 37 for the GTHA, with Chicago and Philadelphia-area residents having access to 24% of all jobs in their respective regions. Other metropolitan areas performed better, such as Boston (30%), San Francisco (35%) and New York (37%). From the perspective of the employer, the number of people that can access each job, on average, within 45 minutes and 90 minutes by transit, are shown in Figure 38. The average job in downtown Toronto can be accessed by 610,000 people within 45 minutes by transit, about 10% of all residents in the GTHA, and by 2.7 million people within 90 minutes by transit (44% of all GTHA residents). On average throughout the GTHA, each job can be accessed by 3% and 25% of the GTHA population within 45 minutes and 90 minutes by transit, respectively. Is transit accessible to those who need it the most? The social equity role of transit does not require that all individuals be treated equally, but rather that they should treated appropriately and fairly. Equity considerations in transportation can include considering income disparity, gender, age, racialized grouping, new immigrants, physical or mental disability and housing insecurity. Transit is becoming more accessible to Ontarians with disabilities. The accessibility required by Ontario legislation is within reach, but challenges remain including inaccessible bus stops in suburban and rural areas with poor sidewalk networks, and older rapid transit stations without accessible ramps, doors, escalators, elevators and wayfinding. The Accessibility for Ontarians with Disabilities Act, 2005 requires Ontario’s transportation systems to be fully accessible by 2025. Nearly 90% of GO rail stations and almost half of the GTHA’s subway and rapid transit stations are already accessible, and between 2002 and 2010 the proportion of accessible vehicles in GTHA transit fleets grew from 31% to 91%. Transit equity is a growing challenge. Many of the region’s low-income households lack access to fast, frequent, reliable service. If they cannot drive or choose not to drive, then they face reduced opportunities to reach work, shopping and other activities; if they do drive, then the costs of owning and operating a car can reduce their ability to pay for food and housing. These equity considerations are important to the quality-of-life for many GTHA residents. Figure 39 shows areas of the GTHA that have good access to transit and areas that have a high proportion of residents with low incomes (areas of need). Many areas of need do not currently have good access to transit; this is an issue that will have to be addressed in the updated RTP. One potential consequence of increasing transit access to areas of need is that property values may increase, which can have a detrimental impact on renters and low income residents. Holistic planning efforts are required to counter impacts on affordability that arise from improved access to transit, such as with the development of transit hubs. The Growth Plan includes policies for a mix of housing in the development that occurs around transit corridors to enhance housing choices for those who rely on transit. Precarious work. A major study carried out by McMaster University and the United Way found that 50% of all workers in the GTHA held permanent, full-time jobs. Precarious employment, (working part-time or contract jobs to make ends meet) is the reality for many in the region. Additional research has shown that precarious employment disproportionately impacts younger workers, female workers and immigrants to Canada. Access to reliable public transit is particularly important for this segment of the population. Traditional transit services generally cannot provide a sufficient level of service to enable individuals working multiple jobs to access multiple locations. Enhancing off-peak service and improving transfer points can help to some degree, but some daily commutes cannot be served effectively by transit, particularly when the destinations are widely dispersed. Travel by children and young adults. The arrival of the “echo boom” generation, and the migration of young adults from Canada and other countries, has led to a large increase in the number of young adults in the GTHA. Young adults already use transit more than older adults (See Figure 41) and new cohorts of children and young adults seem likely to continue or increase their high level of ridership. Recent studies across North America have shown that fewer young people possess a driver’s license, though panel studies have suggested the younger generation is deferring obtaining driver’s licenses and car ownership rather than giving them up entirely. Young adults tend to see transit as one part of a “mobility package” that allows them to choose the preferred mode for each trip. Their expectations are leading transit systems to improve comfort, provide flexible schedules and make real-time information available. The GTHA has specific challenges with respect to travel by children and young adults. While many children still walk or bike to school, this percentage has been declining (see Figure 41), as will be discussed in more detail in Section 4.3. A growing body of local collaborative research by Smart Commute and municipal, community, and academic partners examines the root causes and offers a variety of suggestions to increase walking and biking to school. Similarly, Toronto’s four universities have identified student mobility as an issue, and partnered to create StudentMoveTO, which recently released a report highlighting the opportunity for improving university student travel patterns in the region. Travel by seniors. Older adults in the GTHA travel more by car than they used to; the proportion of trips they make by transit has dropped from 16% to 7% over the last 20 years. This is partly because more seniors are staying in their own homes as they age, and because more are living in suburban areas where using transit is more difficult. Seniors also tend to make trips in off-peak periods when transit service is reduced, and travel to local destinations rather than major employment centres. A lifestyle that relies on car ownership can be challenging for seniors on fixed incomes, and can become a problem if health issues lead to the loss of a driver’s license. These issues will only grow in importance as the GTHA’s population of seniors is expected to more than double by 2041 (see Figure 20). In addition to the likely drop in transit ridership that will occur as working age adults retire, the demand on paratransit services by those with severe mobility constraints is likely to be considerable, although it is possible that new mobility services will help fill this gap (as discussed briefly in Section 4.4). Much remains to be done to improve safety for pedestrians and cyclists, including increased awareness campaigns aimed at drivers and increased enforcement efforts to target impaired drivers, as well as improving infrastructure with better lighting and improved signage and potentially separating different road users where possible. Vision Zero is an international road traffic safety initiative that focused on eliminating fatalities and serious injuries among all road users. The Regional Transportation Plan will look to the successes of Vision Zero to see what lessons can be applied to improve safety in the region. In addition to infrastructure improvements, technological improvements in automobiles are likely to lead to fewer car accidents. Many of these features have already been introduced into existing automobiles and more safety features can be expected in the future. The ultimate safety feature might come in the form of autonomous vehicles, which could remove human error from driving entirely. 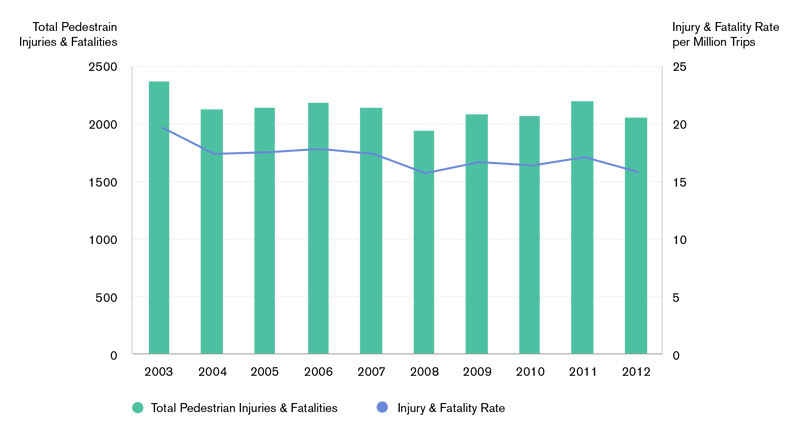 Pedestrian injuries and fatalities are fairly stable but trending downwards (see Figure 42). One area of considerable concern is that while teenagers and young adults are the most likely to be hit, in part because they are more likely to be walking in areas with high traffic levels, seniors are disproportionately killed. More detailed breakdowns on pedestrian and bicycle injuries and fatalities are available for Ontario as a whole, as well as for Toronto specifically, but not the Greater Toronto and Hamilton region as a whole. Does freight move safely and efficiently? Background research to support the RTP review identified three key issues in the GTHA: congestion, managing land use compatibility, and reducing the environmental impact of goods movement. The GTHA is experiencing a growth in truck traffic and volume across the region, and across the time of day, which has an impact on congestion and emissions. Figure 43 displays the truck traffic volume growth on Highway 401 - the backbone of the provincial goods movement network. Safety (motorized vehicle road incidents involving injuries or fatalities or freight train incidents involving injuries or fatalities). You can participate at your own pace and in your own way. If you want to read all of the background information, you can download the complete discussion paper to read offline. You can find relevant background information and provide your input on other topics by clicking on the topic headings below. Introduction: What are we doing?